In an effort to learn more about charitably-minded online moms who donate to good causes we asked 1000 Social Good Moms members about their giving habits, influence of social media and blogging on their giving, and the issues that matter most to them. The survey was sent out in January 2013 with 250 respondents. 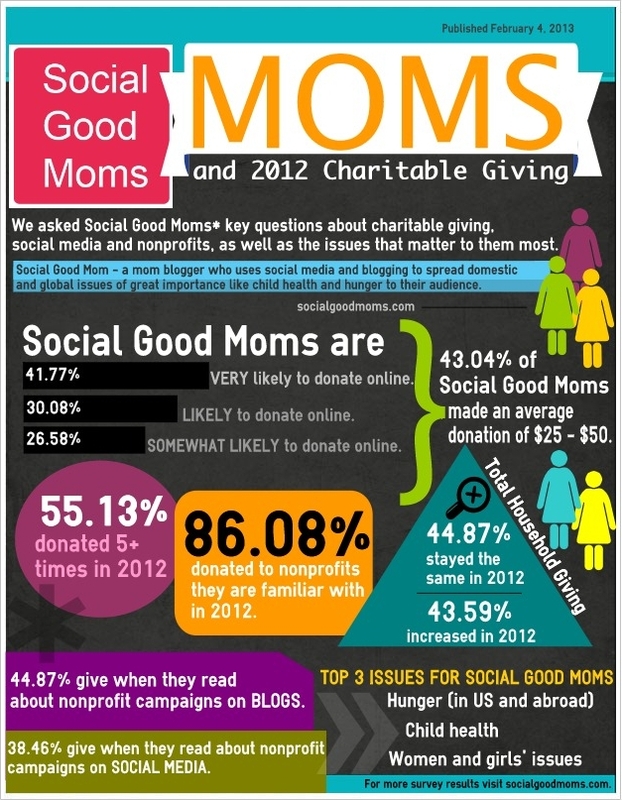 We published some of the key discoveries on our “Moms and 2012 Charitable Giving” infographic. Keep reading below for additional survey data. If you would like to share our infographic you can grab it this link. How likely are you to donate online? How many times did you donate to a charity or nonprofit in 2012? What was your average donation amount? What prompts you to donate to a nonprofit or charity? Choose all that apply. 86.08% – You are familiar with the charity already. 3.80% – There is a celebrity advocating for a charity. 41.77% – You heard about it via social media. 48.10% – You read about the charity on a blog. 13.92% – You noticed an online or print advertisement for the charity. 65.82% – A charity launched a compelling campaign with a great cause. 60.76%- You were encouraged to give by friends, either online or offline. 75.95% – There was a natural disaster or tragedy and you gave. Did your family’s charitable donations increase, decrease or stay the same on in 2012? What issues matter most to you? Choose all that apply?